Cantie Saunt Andras day tae ye aw! Ok, so the news that you are “very much interested” in one of my friends was kind of a shock. I wasn’t expecting it at all, and, yes, it did disturb me more than it should. But I will get over it. I will get over your jerkness. I will get over you. It took me a long time o start watching Doctor Who. Not because I didn’t think it would be good, but I simply kept postponing it. Now I decided that it was time. So I’ve been binge watching it for 4 days now (and yes, I’m already on season 3). But I digress. This is not a post about Doctor Who or my new addiction to it. 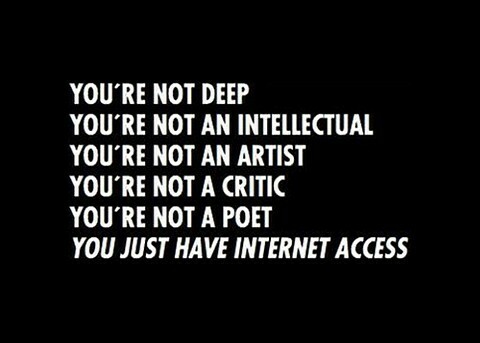 This is about the really annoying internet critics. A few days ago, in the middle of the “The Day of the Doctor” frenzy, lots of people kept posting and tweeting about their excitement, which is only normal. However, that must have disturbed some individuals’s tender sensibilities, because I started to see some comments on how the show “lacked deepness” or “wasn’t that cool”. Jane Austen once wrote that “one half of the world cannot understand the pleasures of the other” and that is the absolute truth. People like different things. Mind you, I’m not criticizing people for not enjoying the same stuff. You may hate all my favorite things and that is totally fine. The thing is you have a right not to like something; but going out there depreciating it is not cool. Ok, ok, everyone has said at least once that some tv show or book were rubbish. We’re humans, we do that. What really disturbs me are those people that like to seat on a pedestal and judge every single thing that they lay eyes upon. And, yes, I have a lot of these on my twitter and facebook feed. My point here is, if a show is loved by millions of people, it must have something good. If a book written hundreds of years ago is still considered a classic, there must be some value in it. I’m not saying that you have to enjoy the show or the book. All I’m asking is for you to consider the possibility that maybe the show doesn’t “lack deepness”. Maybe it’s just you that cannot see it. I turned my essay on Mrs. Dalloway in today. In the end, it wasn’t as good as I wanted it to be, but still it gave me a chance to read a bit of Virginia’s journals and letters. This song describes exactly how it feels to get to know her a little more. Weird and proud of it. Yes, I do have plenty of things to do. I’ve got an essay to finish and a tricky neuroscience homework, which I haven’t even started. I’ve got to finish reading Trainspotting (or maybe I’ll just watch the movie because, seriously, have you tried to read this book?). To say nothing about the exams next month. Yes, it is almost 2am and I am still awake. Watching the second season of New Girl. Talking to friends. Eating. Starting this blog. Yes, I do procrastinate a lot. And yes, this blog will probably be just another form of procrastination.